The recent terror crackdown in Bangladesh under Prime Minister Sheikh Hasina’s dispensation continues to demonstrate her determination to cleanse the system of the poison that has long plagued Bangladeshi society and polity and had become especially acute in the last few years. 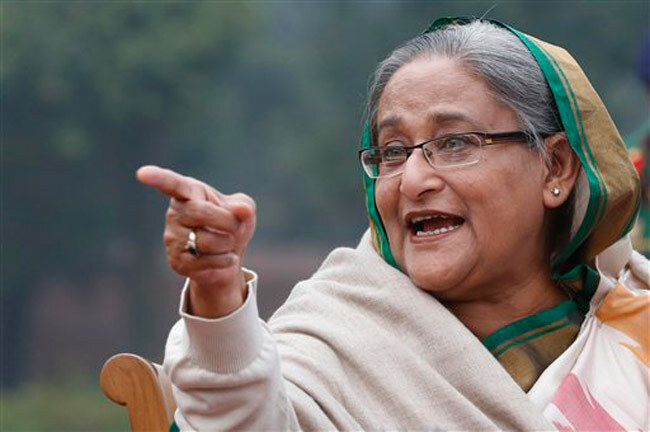 Hasina’s persistence with the War Crime Trials, despite unfair and unwarranted international pressure from some quarter that were inspired and schemed by Pakistan, which has always been wary of its genocidal past, merits approbation and support. The hanging of Harkat-ul-Jihadi Islami chief Abdul Hanan because of his direct role in the Sylhet bombing in 2004, the recent countrywide crackdown on terror networks and modules is direct proof that the legal process in Bangladesh is on a robust footing and that those who have waged war against the very idea of Bangladesh, against the spirit and ideals of the Liberation War and those of Bangabandhu are gradually but surely being brought to justice. However, the Pakistan beholden Bangladesh-Jamaat, though it faces depletion at the senior leadership level, still continues to survive and to pose a continued threat to the democratic spirit and character of the country. Over the years the Jamaat and its supporting Razakar networks have managed to survive by infiltrating various other outfits both social and political. The Jamaat’s formidable sustaining framework – its industrial and commercial bases, its international linkages and fronts in Bangladesh and across the world have made it capable of resisting pressure, it is these which needs to be exposed and eradicated. One of Sheikh Hasina’s major contributions to stability in the region has been her relentless pursuit and decimation of those who collaborated with external forces to dissolve Bangladesh. The pledge to work together to “create a secure environment” in the region that both Prime Ministers Modi and Sheikh Hasina made during the latter’s impressive state visit to India is a crucial pointer indicating both India’s and Bangladesh’s determination to root out terror elements in the region. In an unequivocal signal to terror networks, to terror sponsors and to those who distinguish between “good and bad terrorists”, both Prime Ministers “strongly condemned the recent barbaric terror attacks in India and Bangladesh and expressed their conviction that the fight against terrorism should not only seek to disrupt and eliminate terrorists, terror organisations and networks, but should also identify, hold accountable and take strong measures against States and entities which encourage, support, and finance terrorism, provide sanctuary to terrorists and terror groups, and falsely extol their virtues. They shared the view that there should be no glorification of terrorists as martyrs. They called on the international community to end selective or partial approaches to combating terrorism and, in this regard, jointly called for the early finalisation and adoption of a Comprehensive Convention on International Terrorism by the UNGA.” It is to the failed state of Pakistan, the chief sponsor of global terrorism and of terrorism especially in this part of the world that this section of the joint statement is comprehensively applicable. It is Pakistan which has held hostage Bangladesh’s forward march and in Hasina, the Pakistani establishment finds a huge roadblock to their plans of re-colonising Bangladesh. Hasina’s call for declaring March 25 as Genocide Day in remembrance of the atrocities committed by the Pakistan army on that day in 1971 certainly needs greater voice and support. Serious efforts need to be initiated and a sustained momentum given to this legitimate demand. Elimination of an entire generation of the East Pakistan intelligentsia, mass elimination of Bengali intellectuals and of Bengali Hindus was carried out by the Pakistan army. Their specific orders were to violate women, to decimate the intelligentsia and to empty East Pakistan of Hindus. But just because it was found to be a useful and willing pawn in the game of the Cold War then and global realignment now, Pakistan has always got away with this genocidal past in its recent history. Hasina herself needs to further restructure her domestic politics as she nears the general election of 2019. She needs to streamline and focus on a number of issues that still create hurdles and stand in her way of gaining that undisputed leadership which comes with a democratic mandate. She needs to look within to discern the deadwood and the internal wreckers who still survive, inspired by the razakar mentality and ideology. Undoubtedly Hasina continues to remain a re-assuring pillar of stability in the region and for Bangladesh continues to be the best leader to pull the country further towards democratisation, towards growth and global recognition – in short she continues to pull Bangladesh out of the morass it had itself in till a decade back. While other parties flounder – to take the case of the BNP, which remains stymied in internal uncertainties and appears to be tainted because of its unabashed courting of the Jamaat – while radical Islamists continue efforts to regroup, Hasina’s leadership persists in providing hope and stability and is seen to be a performing one – all essentials ingredients for the success of a democratic polity. Prime Minister Modi was right when he talked of a “shonali adhyay” – golden era or chapter in India-Bangladesh relations, this golden chapter is certainly going to continue beyond 2019 under the leadership of both Modi and Hasina. However, over the next two quick years it needs to be further plated, chiselled, insulated, and reinforced. (Dr.Anirban Ganguly is Director, Dr.Syama Prasad Mookerjee Research Foundation, New Delhi.